Arizona Politics, News, Commentary and Information with a Blatantly Conservative Worldview Presented by an Alliance of Writers, Activists, Consultants and Government Insiders. Excellent post over at Red State Arizona on what’s really happening with the state GOP and how the media has conveniently left out key info. Yes, I know I wasn’t happy with the Sunday edition of the Republic, but I do think that the GOP does need a strong vision if it plans to beat the Democrats in 2008. Pullen is doing fine. If you factor in the operating expenses of both parties, the Dems’ lead decreases substantially. The Dems have spent over $1 million this year on operating costs, compared to only $250k by the GOP; evidence the GOP is better at utilizing volunteers, which the article overlooked. Maybe I should get a job working at Dem headquarters, they must be paying their people pretty good. I’ve heard the Dems have a lot of staffers unlike the GOP. Operating expenses significantly take away from money that could be spent on campaigns and ballot initiatives. So if you subtract the Dems’ operating costs from the amount they’ve raised this year ($1.41 million), that leaves them with only $410k right now to spend on races. Subtract the GOP’s operating costs of $250k from the amount they’ve raised this year ($441k) and they have $191k left, which is almost half of the Dems’ amount – significantly better than less than 1/3 which is what the Republic article reported. Read the rest of the article. Both parties are losing voters. There has been a lot written lately about voter registration numbers. 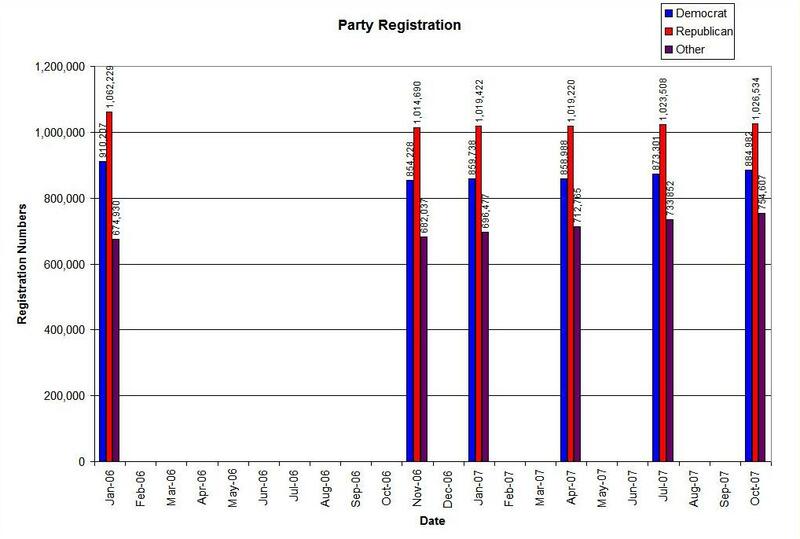 Without a doubt there has been a trend toward voters registering Independent or No Party (Other.) Some have made a big deal about current registration ratios between the parties. Excuse me for missing the party trend. Since 2000 Republicans lost 5.11% and Democratic numbers are down by 5.28%. Based on this view neither party has much of an edge. 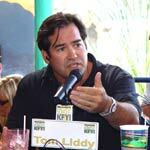 Sonoran Alliance has confirmed that Republican activist, attorney and former GOP County Chairman, Tom Liddy, has joined the list of names seeking the post of Maricopa County Treasurer. Watch for the list to continue to grow as the deadline approaches. A reminder that applications/resumes are being accepted up until 5 PM on Friday, November 2, 2007. Speaking of Pro-Life Educational Events, this is a must attend with excellent national speakers! The Center for Arizona Policy is sponsoring a bioethics conference on Saturday November 3. Respected bioethics experts from around the country will be speaking at “The Biotech Century: Facing Our Future,” a conference for individuals who want to become better informed on a range of bioethics issues within a biblical context. Topics to be covered will be end-of-life issues like palliative care, living wills, withholding of food and fluids, as well as the latest on embryonic stem cell research, assisted reproductive technology, embryo adoption, and cloning. The conference is also cosponsored by Focus on the Family, Phoenix Seminary, the CBC Network, the Christian Dental and Medical Associations, and the Bioethics Defense Fund. The Conference will be held Saturday November 3 from 8:00 am to 4:00 pm at Bethany Bible Church, 6060 N. 7th Avenue in Phoenix. Those interested in attending should visit the conference web site at http://www.bioethicsconference.com/. See where the Presidential candidates stand on life issues including, Stem Cell Research, Roe v. Wade and Partial Birth Abortion. Download the National Right to Life Candidate Factsheet. Gary Ong – President/CEO of Great Wall Enterprises, an Asian food restaurant in Phoenix; Placed second to David Schweikert in 2004 GOP primary. In addition, Sonoran Alliance has also learned that Charlie Gail Hendrix of the Maricopa County Health Care District, has thrown her hat into the ring. The Board of Supervisors have also extended the deadline for receiving application to Friday, November 2, 2007 at 5 PM. Spurred by the article in the The Arizona Republic this morning, I wanted to put together a visual presentation of where the voter registration numbers really are. Here are two graphs. The first graph represents the number of active voters in each party. Republicans still hold an edge in October, 2007 but growth has been stagnant. 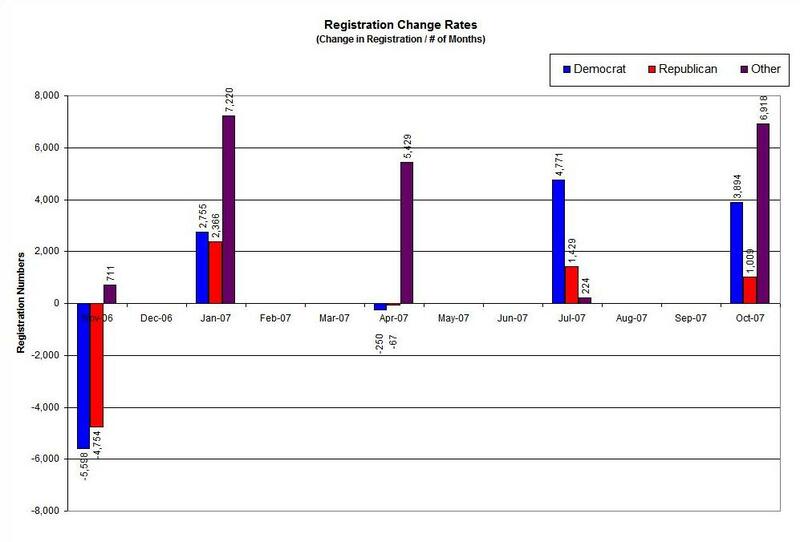 The second graph represents the rate of change in voter registration. This is especially interesting as one can see the highest rate of change (increase) within individuals not wanting to register as either Democrat or Republican but rather, as an Independent. My assessment is that these are voters angry with the Republican party but not quite willing to join the ranks of the Democratic party. I have long held that political demographics are changing to a more conservative population as conservatives continue to have more children and Roosevelt Democrats continue to age and die off. My prescription is that if the GOP can get its act together promoting what is articulated in its platform – low taxes, controlled spending and protecting traditional values – it will regain its strength with the American people. Here is the Excel Spreadsheet (Voter Registration) I used to put this together. This is going to be one of those posts where I get to vent in the beginning but more importantly, I’m going to ask you what we (GOP) needs to do to get back on track. The Arizona Republic is reporting that the Arizona GOP is running well behind Democrats when it comes to raising money and registering voters. The state’s Republican Party has fallen far behind in fundraising, trailing Democrats by a more than 3-to-1 ratio so far this year. Nearly the same ratio holds true for new voters signed up during the past year. Since October 2006, just one in every 10 new voters has registered with the GOP, a startling percentage in a state long dominated by the Republican Party. Well, money and registered voters. Arizona Republicans have been lagging in that area, too. The party still has a 140,000-registered-voter edge, but that advantage has narrowed with the addition of nearly 31,000 Democrats in the past year. Growing fastest of all: independent voters. That voter bloc, now more than 750,000 strong, represents the key swing group in the upcoming election and those going forward. The most recent reports reveal that Democrats have raised $1.41 million dollars while Republicans have raised $441,000 year to date. Yes, these are some of our biggest problems and a view of the glass half-empty. But because we’ve been so focused on the negative, its time we acknowledge we should focus on the positive. So I’m going to ask you to offer solutions. Before you start commenting wildly on this post, I’m going to ask that you not dogpile on state leadership. This is not about Randy Pullen and conversely, its not about sitting around singing “Kum Ba Yah.” It’s about the future: 12 months, five years and 25 years from now. The GOP has to clean its own house. We can no longer afford to look the other way on situations that point out hypocrisy and question our credibility. This is critical on issues fundamental to our party platform. Put an end to out-of-control spending! It’s time to go on a beans and rice diet, pay down our debt and live within our budget. A slightly scathing story in today’s Arizona Republic regarding Laura Pastor’s apparent advantage in hiring due to her father’s congre$$ional po$ition. Pastor is a candidate for the Phoenix City Council and has been presenting her credentials in a leadership role with Maricopa Community College’s outreach program, Achieving A College Education. Maricopa Community Colleges chose the daughter of a member of Congress to run an outreach program over at least two applicants who were more educated and had more experience in fields described as crucial for the job. The college district denies Pastor got the position because her father, Rep. Ed Pastor, D-Phoenix, has funneled millions of taxpayer dollars into the outreach program, including $1 million in federal grants at the time his daughter was being interviewed in 2005. But newly released resumes and applications of the top three candidates for the job show that Pastor had the least experience in working with colleges or with outreach and scholarship programs. Records show that Pastor was hired at a salary of nearly $66,000, which was $16,000 above the advertised maximum range for the director’s job. Unlike the other two finalists, Pastor’s resume shows no experience with at-risk high-school students or any college-related work history. Records show that two phone calls and a letter were lodged with the college over Pastor’s selection, calling it favoritism. The college Equal Employment Opportunity officer dismissed the grievances as unfounded, saying there were no violations of laws or regulations. Rep. Pastor, who sits on the House Appropriations Committee, has denied that he pulled strings to get his daughter the job. He also said that he would have continued supporting the scholarship program whether or not she was hired. Laura Pastor says that she has never used her father’s connections to get ahead. She said she didn’t know that the scholarship program owed its existence to her father when she applied for the job. Pastor has run into similar allegations over campaign contributions, which show that she has pulled in thousands of dollars from employees and lobbyists for timber, airline and other industries connected to her father. She said that she was unaware of the connections to her father and that all of the contributors are personal friends. Maricopa County has at least one candidate for County Treasurer and we’re glad to break the story on who he is. Perhaps it’s best if you read this letter to find out who it is. You can find a better profile by following this link. Arizona's most popular and prominent political blog covering political news and events, commentary and information with a blatantly conservative worldview. We are an alliance of writers, activists, consultants and government insiders. 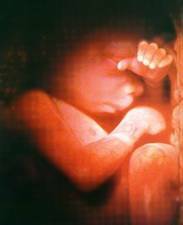 Babies deserve every chance at life!